Paul Clark is walking along a beach in Rio, but he doesn’t know its name. He asks a nice lady who is passing by. In this episode you’ll also learn the Portuguese alphabet. Paul – Por favor, como se chama esta praia? 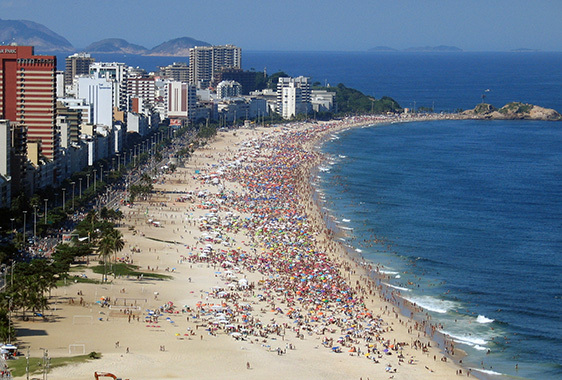 Rosa – Esta praia se chama Ipanema. Paul – E você é a garota de Ipanema? Paul – Como você se chama? Rosa – Eu me chamo Rosa. Paul – Como se escreve o seu nome? Paul – Rosa é um nome muito bonito. This entry was posted on Monday, August 6th, 2007 at 6:58 am	and is filed under Uncategorized. You can follow any comments to this entry through the RSS 2.0 feed. You can leave a comment, or trackback from your own site.